This article explains the most sustainable office furniture options and how to choose between them – you may be surprised by the results. For many organisations the lure of new furniture is hypnotic – soothing messages, dazzling imagery and encouragement from designers. But it is expensive and mostly unsustainable. So what are the alternatives? Over the last decade, the office furniture industry has started to improve its sustainability and companies have entered the market using circular economy principles to drive cost savings and environmental impact reductions. 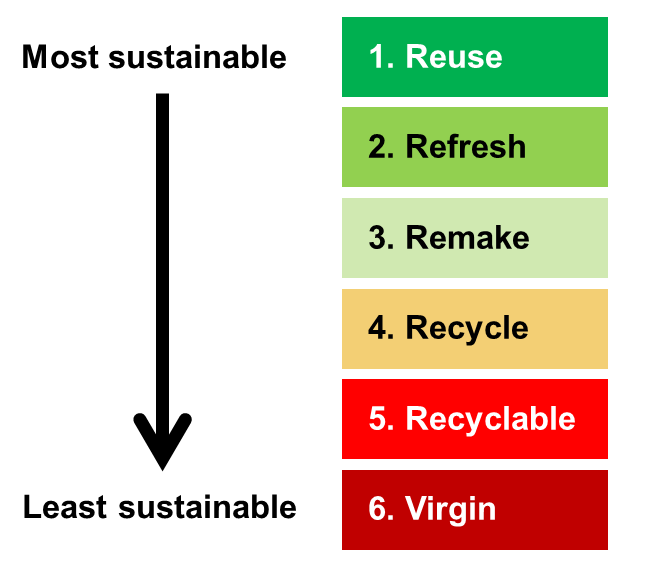 Below are choices available today, moving down a hierarchy (see Figure 1) from most sustainable office furniture to least. The discussion that follows presents the trade-offs between sustainability, quality and cost. Reuse (i.e. Used or Second hand). This is reusing your own or others’ furniture without doing anything to it. Can be relatively expensive if buying others’ furniture. Used prices (e.g. on eBay) can be high compared to some of the higher quality options described below. Conclusion: Buyer beware. 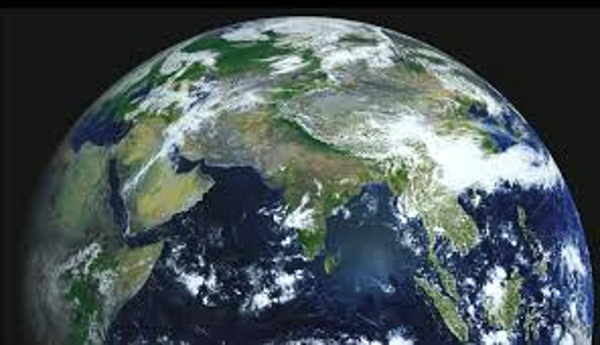 Lowest environmental impact but can be risky, limiting and poor value for money. Can work for very small volumes when you source from an organisation you know and trust. Refresh/Repair/Refurbish: Where furniture has a facelift, such as reupholstering to replace worn or out-of-date fabric. Conclusion: A good option to extend the life of your furniture before a more thorough overhaul is needed – if you can find a good value provider. Remake/Remanufacture: This is where very long life components (like steel mechanisms and aluminium bases on desk chairs) are reused and the softer parts around them replaced. The result, depending on the level of quality required, can be indistinguishable from new and carry the same warranty. For more on remanufacturing go to What is Remanufactured Office Furniture? As-new furniture in your preferred colours and fabrics for a fraction of the cost and environmental footprint of new (most of the cost and footprint is in the metal components). The environmental savings have been calculated at over 80% of a piece made from virgin materials (see References in the footnotes). You need to find a reputable remanufacturer and agree the specification and quality that you are after. Conclusion: Remanufacturing is a good option when done properly, but it is a new concept to many buyers. Find a good provider. Recycle: Furniture made from components that have been reclaimed from used furniture, separated, shredded, melted down, remade into parts, and then assembled into furniture. Same price as new, or sometimes more expensive (despite, in most instances, recycled materials being lower cost than virgin). Environmentally not ideal because of the substantial resources required to melt the materials, remove the impurities and reform them into parts. But it is better than using virgin materials (see below). It is difficult to recycle 100% of some materials. For example, wool fibres become shorter each time they are recycled and therefore need to be combined with virgin wool to be recycled into fabric of the same quality. Conclusion: Better than the options below. Recyclable: Able to be recycled. Manufacturers are now starting to talk about how a certain percentage of a piece of furniture is “recyclable”. These manufacturers are starting to think about what happens at the end of the first life of the product. Sadly, the “recyclable” label does not mean that anyone will recycle the product – that is up to the owner. Virgin: Made from virgin materials. 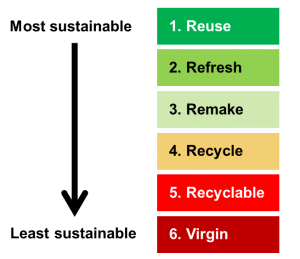 This term is increasingly being used in the language of sustainability to explain the difference between the historical take-make-waste linear consumption model and the circular economy. Limitless quantities can be made for you, albeit with a substantial lead time to make and transport the components from all around the world and then assemble them together. Expensive, because you are paying margins all along the supply chain to miners, raw material traders, refiners, component makers, logistics companies, the assembler (this is often the brand you see) and dealer. Conclusion: The worst option. But if this is where your organisation ends up, choose a manufacturer whose furniture will last for a long time and can be easily remanufactured (you may need to seek professional advice on this, because all manufacturers will make this claim). This information has been summarised graphically, in Figure 2, to help you to choose the most sustainable office furniture solution for your organisation. If you weight quality, sustainability and price equally, then Remade is the best option (see the dotted line in Figure 2). If you value quality above all else, then Remade (by a good provider) also wins because it also has significant cost and environmental benefits. If price is your key driver, remember that used prices that you find may not be the lower than the cost of Refreshing or Remaking. More tips and advice to create a great office are available at the Rype Office Blog, a site dedicated to creating beautiful, budget-friendly, productive and sustainable offices. Rype Office offers design assistance and the full range of sustainable office furniture options. Their speciality is refreshing and remaking office furniture to a high quality – taking the risks and costs out of these cost-effective and environmentally attractive options. Pricing of Used is taken as the average of free (100% discount on new RRP) and 50% of RRP, observed on some websites. Refreshed and Remade discounts to new RRP are based on Rype Office prices. Quality of Used assumed to be 25% of new because, from experience, three of four aspects of a chair’s quality are often compromised (base, seat, arms, back). For Refreshed it is assumed that one of these four is addressed. All four are rectified when a piece is Remade. Sustainability for Remade is assumed to be 75% because remanufacturing has been found to reduce environmental impacts by over 80% (see references above). For Recycled, 45% was used because many leading manufacturers (e.g. Orangebox, Steelcase, Haworth, Herman Miller) offer some models with recycled content of around 40 to 50%.